Overview of the Riot Grrrl Collection at the Fales Library & Special Collections at New York University. The Riot Grrrl Collection documents the evolution of the Riot Grrrl movement, particularly in the years between 1989 and 1996. Because Riot Grrrl was (and is) both a political and a cultural movement, its output was diverse, including writing, music, performance, film, activism, photography, video, and original art, as well as documentation of activism and performance. This research collection provides primary resources for scholars and others who are interested in feminism, punk activism, queer theory, gender theory, DIY culture, print history, and music history. The primary area of collecting is the personal archives of those involved in the creation of early Riot Grrrl zines, music, and activism. These include (but are not limited to) correspondence, artwork, journals and notebooks, audio or video recordings, photographs, clippings, and flyers, as well as any source materials relating to the creation of artworks, writings, fanzines, bands, performances or events. 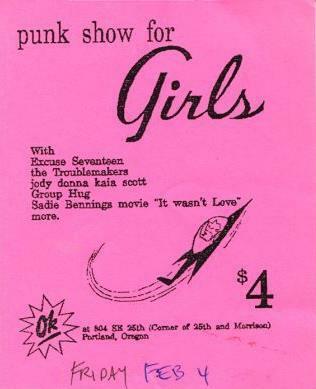 The Fales Riot Grrrl Collection is not just a zine collection, although zines appear throughout the archives. The collection's primary mandate is to collect unique materials that document the creative process of individuals and the development of the movement overall. Since the founding of the Collection in 2009, the collection has expanded to included documentation of queer and feminist activism and performance that emerged from or was inspired by Riot Grrrl in the late 1990s.